Sure, regular gas or electric furnaces are popular. But heating your home isn’t about hopping on a bandwagon. There are other options. And multi-fuel furnaces are a dependable alternative. Available in two distinct models, these furnaces can supplement your current source of heat, while being cost-effective and reliable. Using the same technology as St. Croix multi-fuel stoves, they burn any of six renewable, natural fuel sources—wood pellets, distillers grain pellets, corn, wheat, rye or cherry pits—resulting in minimal emissions and clean-burning, long-lasting fuel. 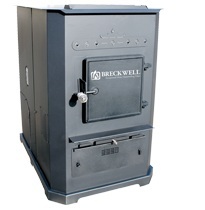 This furnace is able to burn pellets, corn, and other fuels. 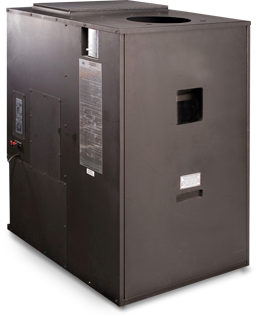 With twin blowers and up to 105,000 BTUs, the 8500 will heat a home up to 3,000 sq. ft. 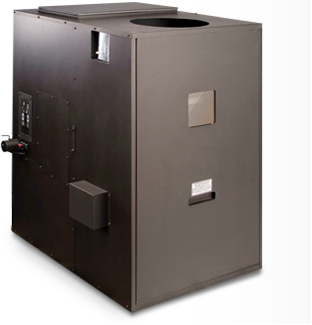 The furnace is designed to use in conjunction with your existing HVAC ductwork and works side by side with your existing furnace. Providing comforting heat for up to 3,000 sq. ft.
*Heating capacity will vary with home construction and climate. ** Hopper capacity varies by fuel. Revolution hopper capacity includes both hoppers. *** Burn rate and BTUH may vary with fuel.